This is a question that I've been asked more than once. Aside from the fact that I fell in love with the creativity and design aspect, here are a few of the other reasons. Gift Baskets are timeless. Before bags and boxes, this is what people used. This is how the neighbor brought food to a wake or a meal after childbirth. And this is how people welcomed a new family to the area. There's a wonderful traditional aspect to giving a gift basket. Gift Baskets are impressive. Even a basket that's modest in size can be so beautiful, appropriate and thoughtful. Gift Baskets bring joy and comfort. Like Christmas and flowers, it is rare that a gift basket doesn't bring a smile and like flowers, it keeps on giving with little gifts often for groups and families and with a little more counter staying power than your ordinary wrapped tie or scarf. Gift Baskets are sharing gifts. What I mean by that is that a good percentage of gift baskets especially food gift baskets are designed to be shared with a group of people. They don't have to be of course, but when it is shared, it is truly a gift that keeps on giving when the recipient shares with family and friends. 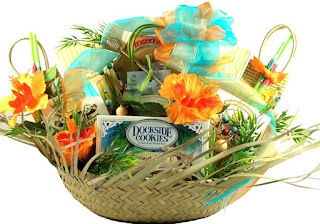 Gift Baskets are appropriate for almost any occasion and customary for many. The only challenge once you realize this, becomes which category, what price range, and how to ship. Gift Baskets are incredibly creative. As mentioned earlier, a well designed gift basket is truly a work of art and beauty. The possibilities are endless and only limited by lack of imagination. This is why I choose to sell gift basket.